The Institute for Women's Policy Research regularly publishes innovative research that promotes equality in all aspects of women's lives. For their latest report, which highlights an over-looked job sector that pays well but employs a low percentage of women, they needed a website that allowed multiple audiences to easily search through the data and understand key discoveries. Sketches showing our working personas and ideas for the mobile layout. I started the project by brainstorming use cases for each target user that we identified with the client. For this site, we were looking at an audience of employers, job counselors, job seekers, journalists and researchers—each with their own goals and needs. While some users, for example, would want to quickly see IWPR's recommendations for getting target job, others would be more concerned with macro-level data, such as the overall percentage of women in factory jobs. Sketches made while exploring concepts for the search UI. While our client was working to finalize the report, I looked through the raw dataset of jobs to figure out the most useful ways to search and filter the data. After several iterations, I added key indicators (such as the counter that informs users of how many referral jobs are listed) and suggested adding a live data visualization so that more journalistic and policy-focused users could quickly see the gender breakdown of their search results. Working with the visual designer, I created wireframes for necessary page templates. I focused on ensuring the clarity of the job search page which helped the site go quickly through the visual design phase. 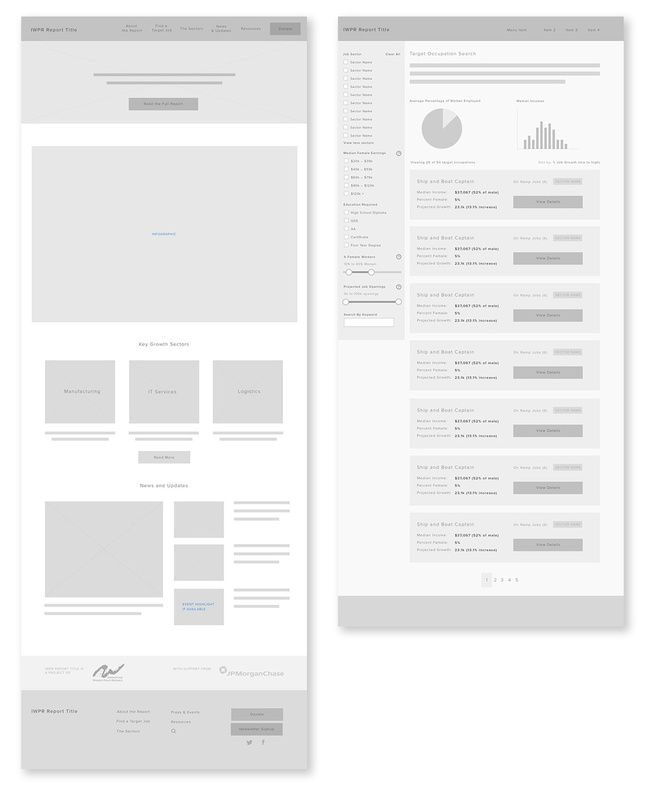 Wireframes for the homepage (left) and job search page (right). See the full site at womenandgoodjobs.org and the internal search page here.